Developed in 2008 to offer successful recreation, athletic, therapeutic and educational opportunities for those with different needs. We believe everyone should have opportunities to maximize their development in safe, nurturing, and natural environments. Whether the students learn the fundamentals of gymnastics, swimming, handwriting and other developmentally appropriate activities our program is designed to attend to the sensory and behavioral needs of each individual and we tailor the goals of each student to match their specific needs. 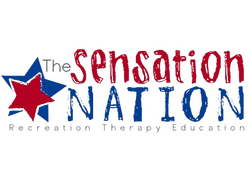 The Sensation Nation is a unique team of Occupational Therapists, Kinesiologists, Recreation Therapist, and Coaches. Bringing our skills and knowledge together to motivate & teach our students. We offer a variety of programs ranging from one-on-one instruction to groups and birthday parties. Happy Birthday to The Sensation Nation! We turn 10 years old on September 8th, 2018. We are proud to announce our nomination for the SERA. This special award honors members of our community who go above and beyond in their commitment to the youths with special needs in Santa Clara county. The SERA awards promote special education for youth in the community. Further, they recognize those individuals and organizations that continuously give of their time, energy, and skills to help children in our community with exceptional needs.